I’m happy to report that my pair of albino Bristle-nosed Plecostomus has made babies. 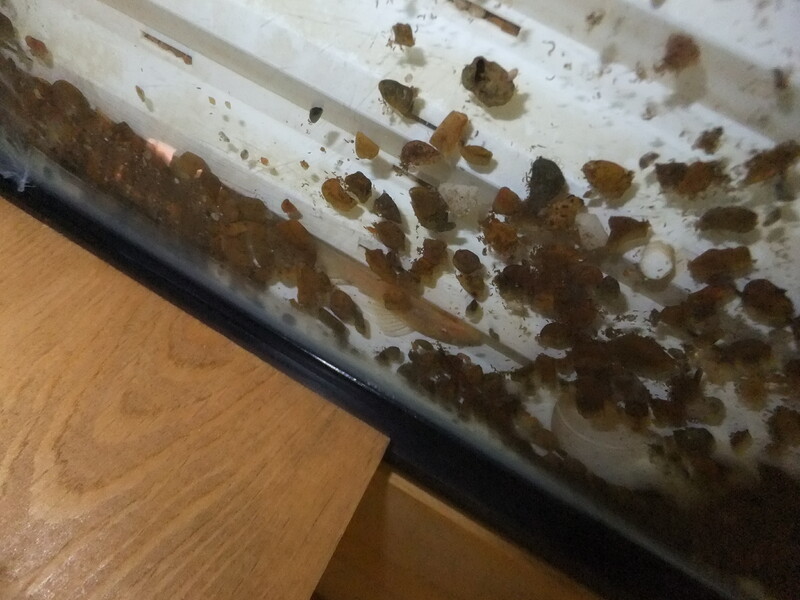 Not very many, I counted only four, but I am thrilled to see the cute little ones scurrying around the tank. The four babies are all the typical brown-colored Pleco and I have seen no albinos. The male is a short-fin and the female is a long-fin. I wonder what the babies will be. 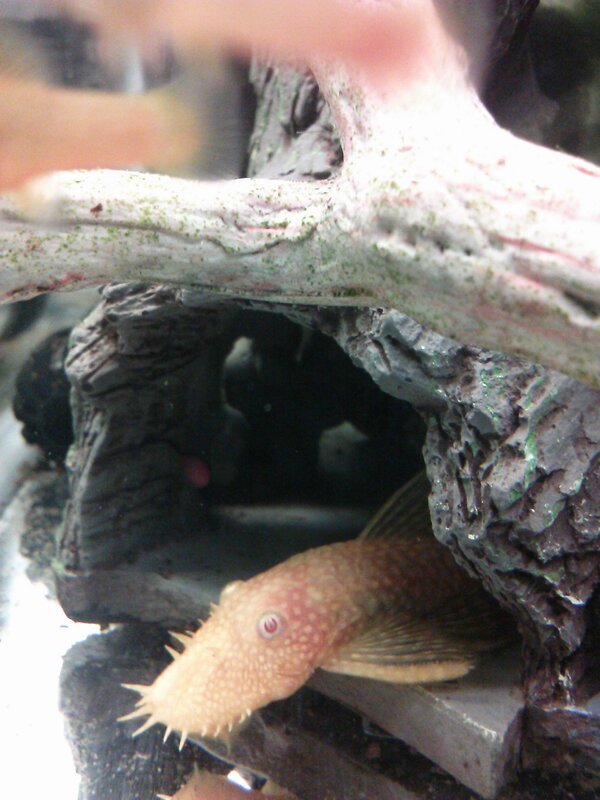 I can’t say much about how to breed the Bristle-nosed Pleco. I put the pair in a ten-gallon tank, provided a nice rocky cave, and made some regular water changes. They get the standard flake foods plus occasional peas, and I do have a small piece of driftwood for them to scrape. The male Bristle -nose has the bristly nose. I fear that I may have siphoned away baby Plecos when I changed water. Since the tank has a bare bottom I always siphoned the detritus (do they call it “mulm” anymore?) off the bottom. I dearly hope that didn’t happen. I have become very attached to my little colony of Red Velvet Swordtails. I have 4 females and two males. They live with two Marigold Variatus Platies. See the male Swordtail in the background with his sword tail. I’ve been wanting to raise a few more but had to wait for an open 10 gallon tank. Two days ago I finally had the opportunity to put a female into a tank that I filled with Java Moss and Hornwort. The tank also has two Julii Cory Catfish and two small brown Bristlenose Plecostomus. The very next day POP goes the fishy! I noticed a baby or two but didn’t pull the female out immediately. It’s impossible to tell if she was done having babies or not. So I waited about 2 more hours, then went downstairs to catch her. Wow, she was chasing her own babies so hard I wondered if any would be left by the time I caught her. Fortunately, I think there are about a dozen survivors. Swordtails can have 25 or 50 or even more babies but this was a young mother and I don’t have room for too many more fish of any kind. These babies will hunt for small food particles they find among the plants. I also have a Microworm culture going, plus I will make up a batch of baby brine shrimp when they are a week or two old. I’ll crush up fish food flakes and also dried shrimp. I think they like a lot of protein when they are growing, plus it gives them great color. When they are older they do fine on plain fish food flakes. While we’re at it, let me show you one of my male Green Swordtails. Most people wouldn’t give a Green Swordtail a second glance but what do you think of this guy? In the tank right next to the baby Swordtails, the Albino Bristlenoses are probably enjoying life in a tank to themselves. I find the male in the “cave” or at it’s entrance and the female can be found anywhere. Now that they are settled into the new tank I’ll try some major water changes in the next few days and see if that gets them in the spawning mood. The male is at the cave entrance to the right and the female is hanging onto the sponge filter in back. Here are some pictures of young Bristle-nosed Plecostomus, or Plecostomussseses, or Plecostomi, oh hell with it, Plecos, that have found some interesting places to survive. First, at a friend’s house, there is a tank with an undergravel filter. 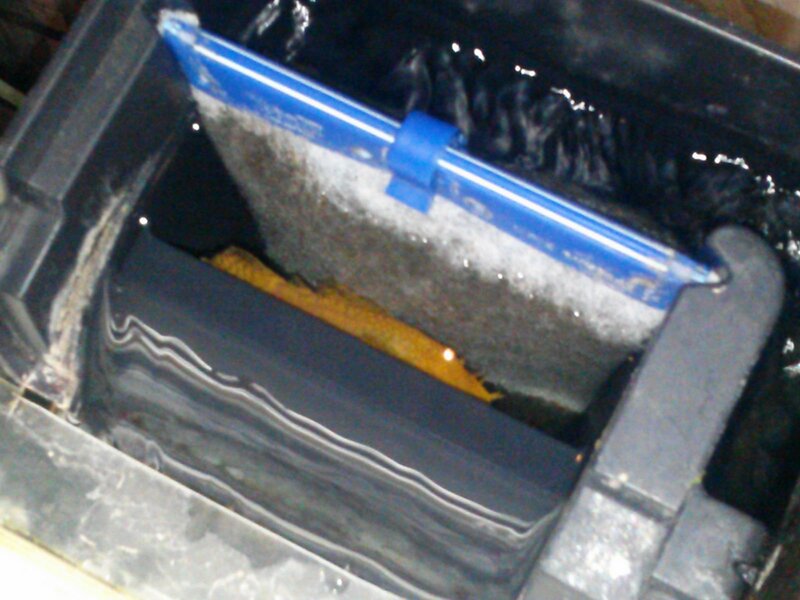 He didn’t connect lift tubes to every place on the plastic plate, and the gravel didn’t cover one opening so a little Pleco went into the hole and has been living there ever since. He could find his way out if he tried, and maybe he does on occasion, but during the day he can be seen only by crawling UNDER the tank and peering up through the glass bottom! 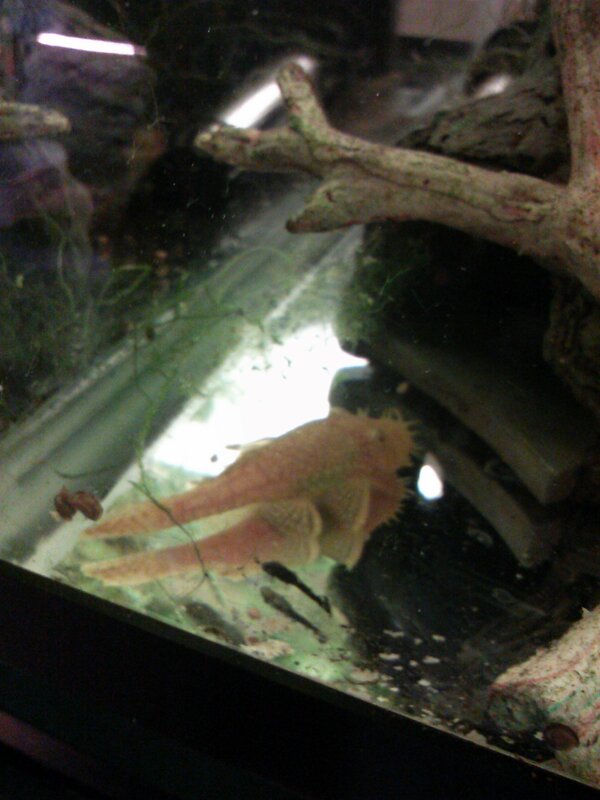 In my 55-gallon community tank I have a male albino Bristle-nosed, or Bristlie as I have heard them called! Last night I watched him swim up to the outflow on the filter. 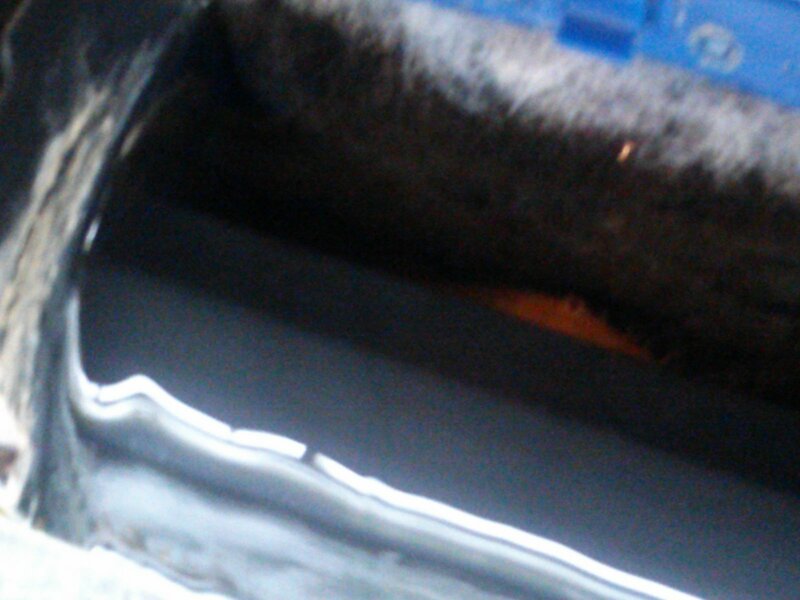 It’s the type of filter that draws water in and then it overflows like a mini-waterfall. This outflow gets coated in algae but, now that I think about it, it seems very clean lately. I removed the cover of the filter and…. Look at that eyeball staring back at me. With the flash on the camera. This little fish actually “climbed” with his sucker mouth about 2 inches above the water level of the fish tank, against the current and into his little haven!